This is it guys! The decisive episode before the season finale. Will they pointlessly kill someone? Yes? Good! Come discuss, you 6 people who still watch the show with me. Spoilers ahead. Again, if you write your analysis in another Kinja blog and want it linked here, gimmah the link and I’ll link it here in the main article. Link. So as expected, people got a big case of the dumbs. So there will be consequences. Hey, a bat in the gun! Foreshadowing! Carol and Daryl, I love you both but I swear you are super dumb lately. 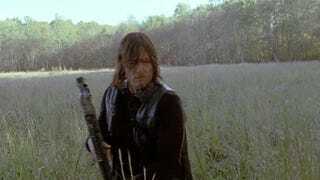 OK, Carol is still a BAMF, but Daryl is DUMB!! Big belly bruise. Foreshadowing? Foreshadowing! That barn looked a lot like the video-game version of Hershell’s farm. Are there that many farms in Washington? I honestly don’t know. I know about the Washington brand of apples from when the brand thought that TV commercials for apples were necessary for some reason, so maybe! OK 2 badasses tied to a tree, K-I-L-L-I-N-G everyone in the future.